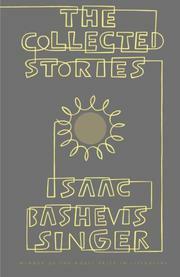 Forty-seven stories from Singer's 100-plus canon would more appropriately be called "Selected Stories" than "The Collected Stories"--but, if slightly mislabeled, this splendid gathering does indeed embrace the ever-surprising variety of Singer's steady short-story artistry over the past 30 years. Only six of the pieces here have not previously appeared in one of the eight story collections--and they are a slight group: an autobiographical fragment of young, recently-arrived Isaac in Brooklyn (material which appeared, in different form, in the Lost in America memoir); portraits of acquaintances--from literary Warsaw to Central Park West; and two lesser examples of the more mystical Singer of Krochmalna Street. The rest, however, is prime Singer indeed: old-world classics like "Taibele and Her Demon," "Yentl the Yeshiva Boy," or "Gimpel the Fool" in zesty tandem with such ironic, autobiographical incident-stories as "The Bus." Dybbuks on one page, taxis on the next, the prose never less than finely airy--here is certainly a grand introduction to Singer for newcomers, even if the recent collection Old Love serves something of the same purpose in far less daunting form. So, with its brief, sly yet tender introduction (the collection is dedicated to the memory of editor Rachel MacKenzie), this will draw in Singer devotees for repeat readings; and it is an essential acquisition, of course, wherever those previous collections are not available.